Monday October 8th 1894 It was cold this morning but got pleasant after awhile. I did up my morning work and got an early dinner. They had packed up their things to go home. We went in and directly over home where we had a pleasant call and at Fannys too. We then brought them over to the four oclock train as they go back by Burlington We have had a delightful week with them. I did my evening work with Wills help and wrote a letter. 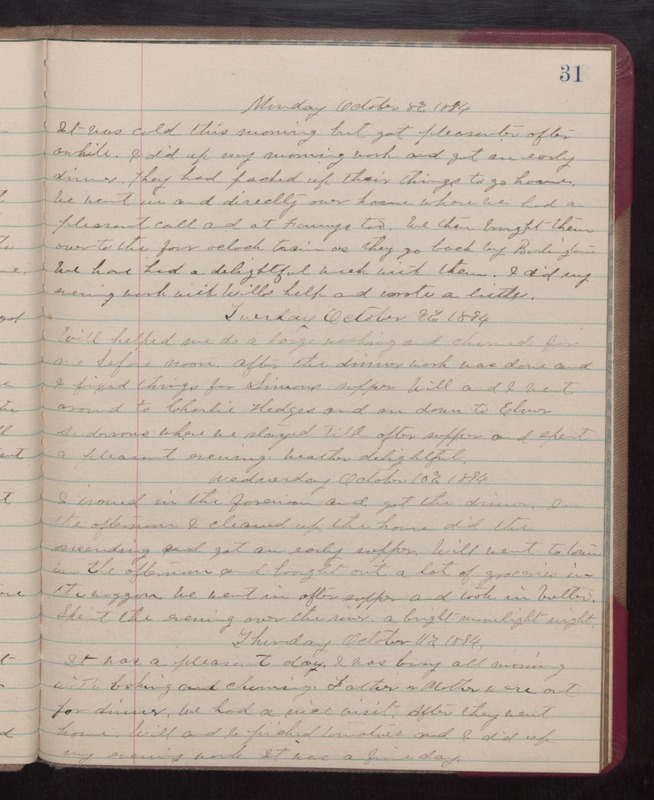 Tuesday October 9th 1894 Will helped me do a large washing and churned for me before noon. After the dinner work was done and I fixed things for Simons supper Will and I went around to Charlie Hedges and on down to Elmer Andersons where we stayed till after supper and spent a pleasant evening. weather delightful. Wenesday October 10th 1894 I ironed in the forenoon and got the dinner. In the afternoon I cleaned up the house did the mending and got an early supper. Will went to town in the afternoon and brought out a lot of groceries in the waggon. We went in after supper and took in butter. Spent the evening over the river. a bright moonlight night. Thursday October 11th 1894 It was pleasasnt day. I was busy all morning with baking and churning. Father and Mother were out for dinner. We had a nice visit. After they went home Will and I picked tomatoes and I did up my evening work. It was a fine day.